One of my goals right now is to figure out all the features and buttons on my DSLR camera and to learn how to take better pictures. So I love putting together the stylish things post things post because it gives me the opportunity to practice my photography skills. 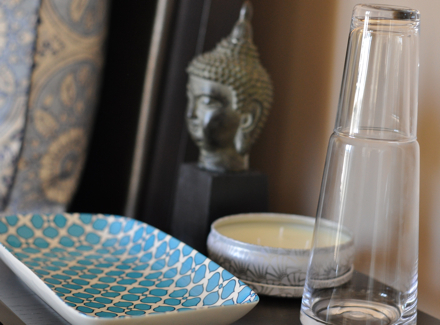 I just added this bedside carafe to the guest room side table. Perfect timing since my parents just arrived today for a weekend visit. My new favorite make up routine is to simply use bronzer and the NARS multiple to achieve a healthy and glowing (natural) tan for the summer. Lately I have been obsessed with sweet and salty crunchy treats. First it was Stacy's cinnamon sugar pita chips and now it's kettle corn. And in case you missed seeing this on my Facebook page, I now have my own makeup assistant.